It started with a table mat in The Woodman. For those of you who may occasionally enjoy a lunch in The Woodman along the village High Street, you may have noticed that the placemats depict photographs of the village of early 20th century or even late 19th century. 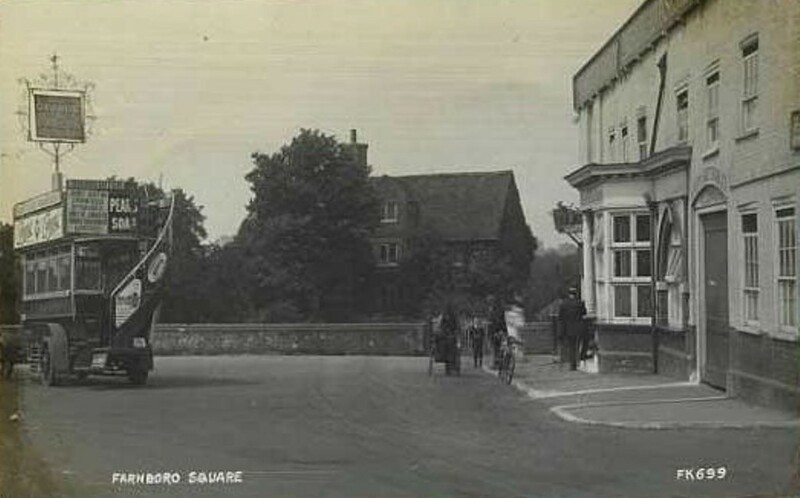 Many of the pictures are easily recognisable such as the original village school, the post office in Church Road, and the church without its cap. Included in the range of pictures are those of the local public houses. 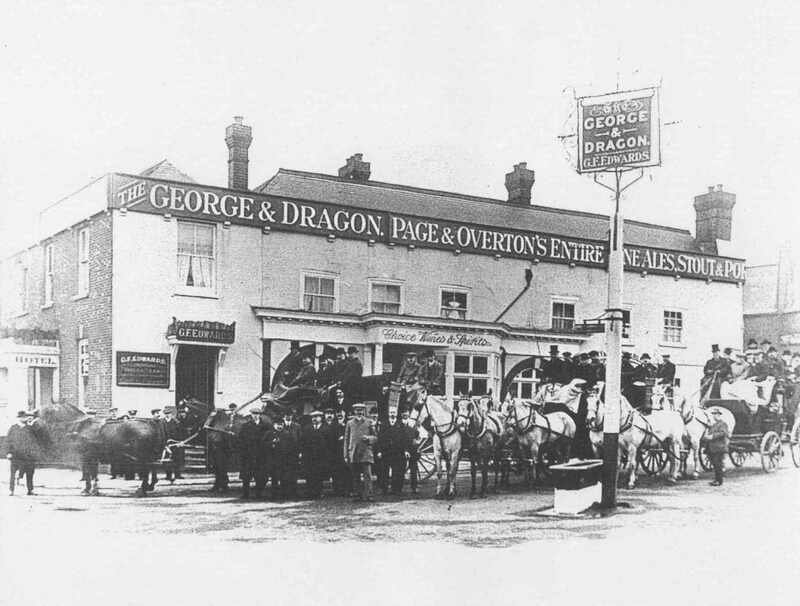 The most prominent building on Farnborough High Street for many centuries was of course The George and Dragon, see the first two photos below. 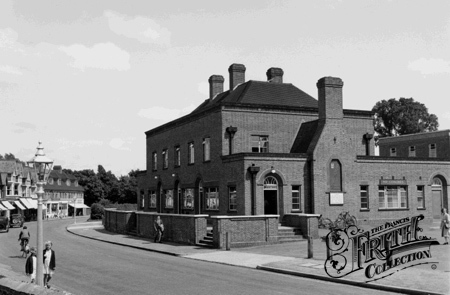 In 1937 this was replaced on the same site by The George before in the current century after a period of some dereliction this was pulled down and the site became a new development of houses and apartments. And there are photos of the New Inn, now renamed the Change of Horses. In fact on the day that the name changed, Saturday 1st September 1973, it was also briefly named the Golden Nugget Saloon. The then innkeeper, Sid Batt, was granted a special licence, and the Inn was renamed the Golden Nugget Saloon from 10.30 a.m. to 5 p.m. to coincide with the annual Farnborough Fair which on this day adopted a "Wild West" theme. At 5.30 p.m. the name altered again to the Change of Horses - thus it became the only Inn with 3 names in one day - see the poster to the right, click to enlarge.. 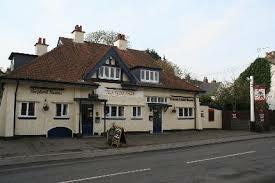 But there was also once a fourth public house in the village - the Coach and Horses. This was further along the road from The Woodman in the direction towards the original village school, and on the other side of the road. Like the Woodman at that time it was a beer house. That is, it sold only beer and cider, and definitely neither wines nor spirits, which of course patrons of the New Inn and the visitors to the George and Dragon hotel may have expected after their coach ride from, or en route to, London. The picture of the pub is not very complimentary, it is a detached house that had seen better days, with fencing following on from it. This would suggest that the picture was early 1900s. The Coach and Horses was pulled down around 1907 and the site is now occupied by the houses shown in the photo above. All four pubs were busy during the 19th century, and often with the same landlord at the helm for twenty or more years. 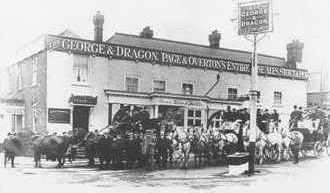 For example The George and Dragon had William Shuttleworth and James Martin as Landlords from 1841 to 1871. 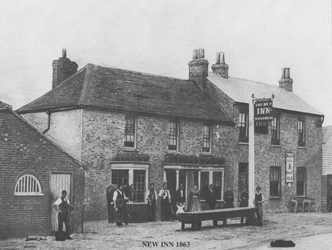 The New Inn had James Weatherley as the landlord from 1871 to 1891 after Robert Sessions had been the landlord for nearly thirty years. The Woodman had John Goodchild as landlord from 1871 to 1901 before his son-in-law, Harry Birchell took over responsibility in 1911. As for the Coach and Horses, Henry Penfold took over the running of the Beer House by 1871 and remained as the landlord until his death in 1906. By the early 20th century there were movements against the availability of alcohol and in particular the numerous pubs, hotels and beer houses, in London. 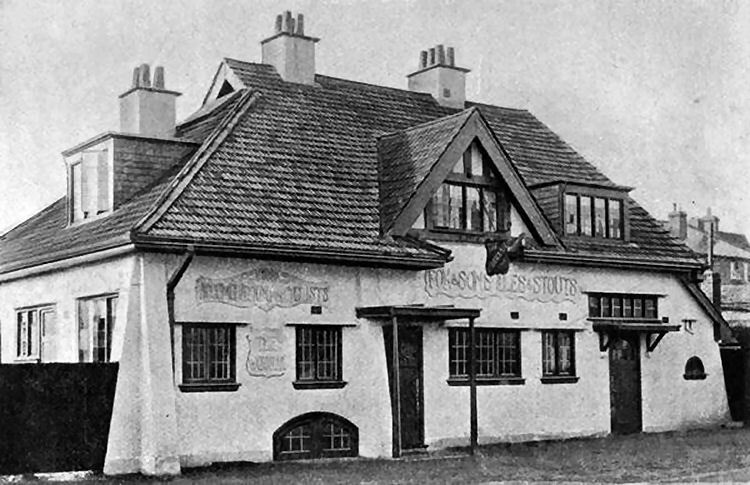 In response to an article in the Daily News (a London newspaper) in 1904 on this subject a local Farnborough man drew to the readers’ attention that the civil parish of Farnborough,(then comprising Farnborough village, Green Street Green and Locksbottom) could boast 9 pubs serving a population of 1261 in 275 houses, or a pub for every 140 people, including women and children. With Henry Penfold’s death at the age of 60 and his wife’s death the following year, it would appear that an opportunity had arisen to address this issue. By the census of 1911 the six Nile Cottages beside the pub would still be in existence, but now followed by the development of 8 new cottages and Orchard Road just beyond them. The Coach and Horses was no more. It would be nearly another 80 years before another pub disappeared within the old civil parish.. However, the original complaint that we had too many pubs for the local population has been addressed by the increase in houses and consequently the population. Just in case anyone was worried that public houses are disappearing!